This week on RPG Lessons Learned: Dusty, Brian, and Mike return to their East Texas University adventure with game #2! This game was full of challenges, and fun. Unlike game #1, this was a very good game. It was a lot of fun. 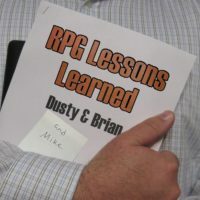 This week on RPG Lessons Learned: Dusty, Brian, and Mike do a data-driven post-mortem on their Pathfinder Beginner Box campaign! Dusty mined his post-game recap e-mails to take a look at two simple measures of the campaign: Experience Points and Gold Pieces. The results are surprising.